Today, following the private beta that completed this past weekend, Ubisoft® announced that the Tom Clancy’s The Division® 2 Open Beta will run from March 1 through March 4 on the Xbox One family of devices including the Xbox One X, PlayStation®4 computer entertainment system and Windows PC. More details will be released soon. 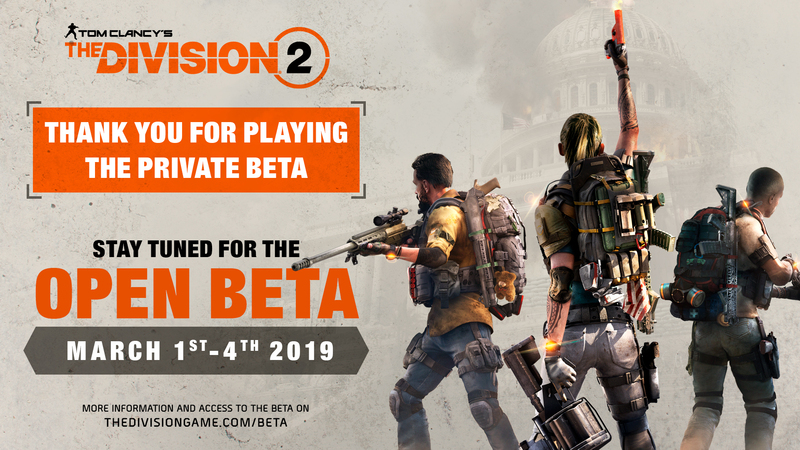 For the latest news about the Open Beta, please visit: www.thedivisiongame.com/beta. Led by Massive Entertainment in collaboration with seven other studios around the world*, Tom Clancy’s The Division 2 is the next evolution in the open-world online shooter RPG genre that the first game helped establish. Set seven months after a deadly virus was released in New York City, Tom Clancy’s The Division 2 will bring players into a fractured and collapsing Washington D.C. The world is on the brink, its people living through the biggest crisis ever faced in human history. As veteran Division agents, players are the last hope against the complete fall of society as enemy factions vie for control of the city. If Washington D.C. is lost, the entire nation falls. Building upon more than two years of listening to and learnings from The Division community, Tom Clancy’s The Division 2 will offer a substantial campaign that organically flows into a robust endgame, to create a cohesive and meaningful experience for all types of players.